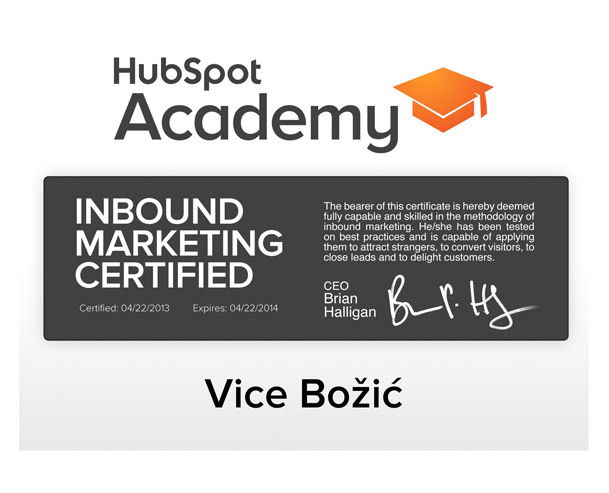 On April 2, 2013, Hubspot launched a new version of their free inbound marketing certification program. Since lots of things have changed from previous version, I decided to upgrade my existing certification and to take the test again. I passed the test a couple of days ago and thought I’d share a few tips on how to prepare for – and most importantly pass – the exam. 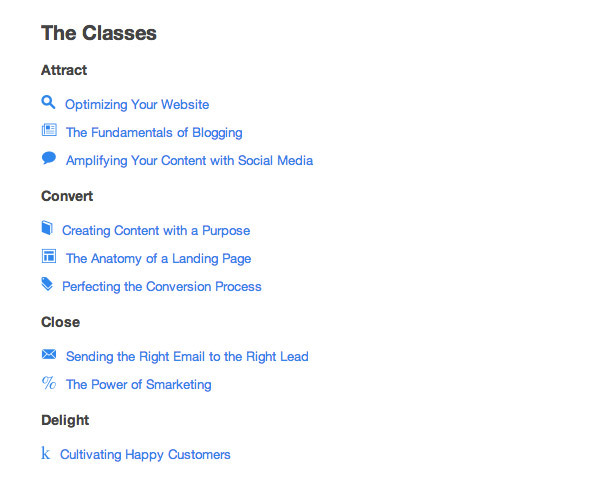 Firstly, I must say that Hubspot did a really great job providing all the necessary information for you to pass the exam – 9 video classes with additional links to various blog posts, ebooks and guides. To pass the exam, you will need to answer 50 multiple choice and true/false questions within 60 minutes. I know that might seem like a short amount of time, but if you are prepared that’s more than enough. Also, you have three chances to pass the test, and if you do not pass, you will have to wait 48 hours before taking the test again. Best way you can prepare for the exam is to go through a 9 video classses that are categorized by inbound marketing methodology – Attract, Convert, Close and Delight. I suggest that you watch all of them, as they are all very useful. I took approximately one week to go through all of them, plus couple of days for notes and preparation. Also, you can download a quick study guide to help you with your preparation. Before you can watch videos, you will need to signup for a complimentary Hubspot account. Once you have submitted your answers, you will know the results immediately, and hopefully if you passed the test you can show off your new certificate. Also, you will get a certification badge that you can embed onto your blog or website. We are the Facebook, you will be assimilated! I was looking through this post and realized that the content is a bit out of date. At this point we have 13 classes, a new study guide and more time to take the exam! In the lieu of keeping your content fresh and solidifying inbound links, if it is not too much trouble, we would love for you to update the post. I stumbled across this post and it ranks quite high on search engine results. Here is a link to the Inbound Certification page: http://academy.hubspot.com/inbound-certification. I am happy to provide you with more information on the content if need be! Nice post. Well done Vice… Congrats. Congrats on passing! Glad you enjoyed the certification. If anyone is reading this and has questions, don’t hesitate to reach out.